Do Lasers Really Minimize Scar Formation? In order to reduce or minimize scar formation, some clinicians have begun using lasers on an incision or wound within 3 months after injury. This method, which is attempting to target the early wound-healing process, has been used with some success, but there was no systematic review of whether the practice is recommended. A recent systematic review evaluated the clinical evidence for early laser intervention to reduce scar formation in studies where laser treatment was introduced in the early stages of wound healing. The authors identified 25 studies, most of which were controlled studies, and were able to compare laser treatment to untreated control scars. Most of the studies investigated laser treatments applied to surgical scars, but the review also included one study on burn scars and one study on surgical or traumatic scars. 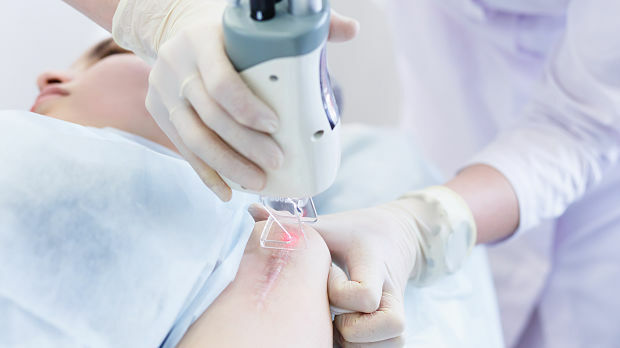 When lasers were applied immediately after or during wound closure, the intervention was applied to the inflammation stage of wound healing. In this case, three of four studies on laser use in this stage found significant improvement on treated scars compared to untreated. The next stage of wound healing is the proliferation stage which mainly starts at the time of suture removal. Six of the 16 studies at this stage found significant improvement in major clinical outcome on laser-treated scars. The final stage of wound healing which occurs three weeks to two years after injury is known as remodeling. Five studies looked at laser use during this stage and significant improvement in clinical outcome was seen in two of the studies. Overall, the authors note that in general, the 25 included studies were of limited methodological quality and that limitation should be considered. However, the review suggests that laser-treated wounds and scars showed benefit from laser intervention. The authors state that more rigorous studies are needed.